When he swivels his hips and takes a half step forward, it’s hard to imagine Ron Tritto wrestling an out-of-control drunk over the hood and handcuffing him. And when Tritto says in a calm voice to his sweaty-palmed students, “Let’s start off with our sugar push,” it’s hard to imagine him pursuing a suspect at 100 miles per hour in his flashing, siren-blaring police car. But yes, this neatly dressed and soft-spoken dance instructor served 32 years in the State Police. 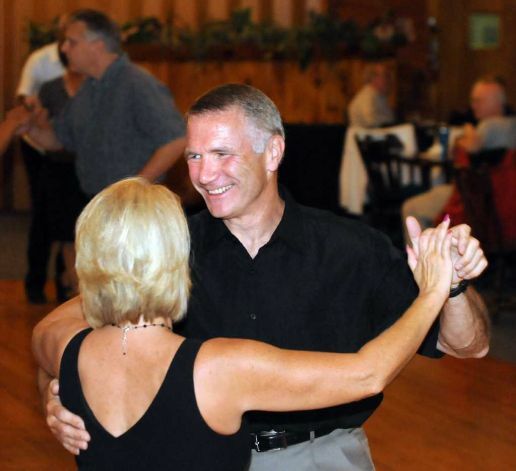 When he retired in April 2009 — a captain in charge of about 100 troopers and officers in Albany and Rensselaer counties — he embarked full time upon his second career: ballroom-dance instructor. Granted, he says before a recent class at EverGreen Country Club in Castleton, most guys in our society don’t perceive ballroom dancing as a cool, macho thing to do. And who’s more macho than an officer of the State Police? When Tritto starting taking dance lessons 12 years ago and started teaching two years later, he was very much a part of that macho culture. He got the expected ribbing. Colleagues called him the dancing captain. But it wasn’t any worse than if he had decided to become a Mr. Atlas instructor, says Maj. Bill Sprague, commander of Troop G in Loudonville and colleague of Tritto since 1978. Tritto leaves nothing to chance as the 17 people — nine women, eight men — trickle in for the beginner’s class (at 7:15 p.m. every second and fourth Friday, followed by a two-hour dance). He arrived an hour early from his home in Valatie to set up the sound equipment. Tonight’s lesson is West Coast swing, and he has his Otis Redding, B.B. King and Big Joe Maher ready. He has had couples erupt into argument, and there’s been a time or two when they’ve stalked out of class. But most classes are like this one — low-key and well-ordered affairs where the occasional grimace gives way to smiles of relief and accomplishment. Tritto conducts the class in the same exacting manner that he wrote crime reports, explaining the dance and steps, counting down the music, demonstrating the moves and patterns, and then striding from couple to couple to answer questions and gently correct mistakes. His dance partner is Karen Mason, who joined one of his classes three years ago and then started working for him as an instructor. She says he exhibits the traits of someone with military-style grooming. It was something he wanted to learn ever since watching his father, Nick, dance at parties. Samba, rumba, jitterbug, it didn’t matter, he moved fluidly through them all. He didn’t realize until he started lessons what a great stress-reliever dancing was. He could forget about the murder investigations while trying to catch the rhythm of the music and figure out which foot went where. He picked it up quickly and started teaching after two years. That came easily, too. He had trained investigators for three years at the State Police Academy. Tritto also teaches in his home studio and the adult-eduction programs in the Averill Park, Schodack and Voorheesville school districts. Those classes started this week, but students can still enroll. It’s optional, of course, unlike the encounters in Tritto’s last job. The biggest difference, he says, is there are no dance police. He hasn’t once had to arrest someone on the dance floor.